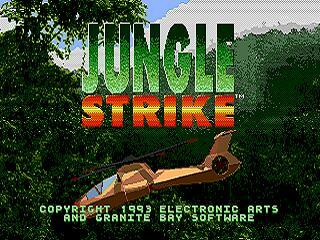 Released in 1993, Jungle Strike is a helicopter shoot 'em up where the player takes control of a Comanche. Armed with machine guns and powerful rockets, players are sent to destroy enemy weapons and installations, rescue hostages and capturing enemy personnel. Players can also acquire hovercrafts, motorbike and F-117. Best time: Single-segment 0:42:41 by Wesley 'Molotov' Corron on 2012-06-24. Mike89, for (perhaps unintentionally) tricking me into running this game. I probably took your Desert Strike comment a bit too seriously, but I'll still hold onto hope that it wasn't a joke! Nitrodon, for using weird emulator magic that goes over my head to confirm that jinking is faster and not just my imagination. It seemed obvious, but it was good to have confirmation anyway. SDA staff, for obvious reasons. Jinking: Moving diagonally is the fastest way to get around. The isometric controls make this a real pain sometimes, but it honestly becomes second-nature at some point. Also helps that I've been playing the game every now and then since I was 5 or 6. There's also another problem with jinking though: You need to hold A (the hellfire button) in order to do it. The SNES port apparently made use of the shoulder buttons for this instead, but who plays that version? This means every time I wanted to do a quick attack run on a say 150 armor enemy, I'd have to release A, tap it again, tap B twice, and then hold A again. Easier than it sounds most of the time, but you'd be surprised how many attempts ended because of that problem. Co-pilots: Before you start the game, you can only choose between two loser co-pilots because the other three are MIA. The only real difference between them is the fire rate of your hydras and chaingun when you hold the buttons down. Faceman is a helpful upgrade for someone without mashing skills (like me), because his chaingun fire rate is enough to make it a decent weapon. Roz is the best you can get, because I don't see any difference between her and Wild Bill. The game's comments about winch skills are a total load of crap. Targeting: The game auto-locks on to stuff, so you don't have to fly straight at something in order to hit. Did I just say you don't have to fly straight at stuff? Oh, I'm sorry. I got that mixed up with how the targeting system is SUPPOSED to work. In reality, you fly towards something and fire everything in your arsenal and pray that even one missile hits. This isn't as noticeable in casual play, but during a run, this gets old very quickly. Probably over 90% of my attempts ended in campaign 1 because of this problem. This crap even screws you over when your missiles DO hit, believe it or not. Let's say you encounter a watch tower with a pesky little bugger on top firing pew pew shots at you. You've had enough of his sass, so you fire a couple hydras at the tower as you pass by. Both missiles hit the target, but the guy is still alive and laughing in your face as he continues to shoot you. Normally one hydra will instantly kill a tower guard, but for some reason, the game hates you and registers those hits as hitting the tower instead. Stupid stuff like this is why I tend to fire multiple hydras at watch towers, because you just can't rely on a single shot. If you're still thinking this doesn't sound too bad, well I've got more! You see, there's this tiny problem with moving targets. By that, I mean you tend to miss them. A lot. You see, your co-pilots don't understand the concept of leading a target. They love to fire everything at the enemy's current position, regardless of whether the enemy will still be there by the time the missiles arrive. This is why I often fire at point-blank range, because there's no other way to reliably hit some enemies quickly. But wait, I'm not done yet! No sir, this gets even better by the second. Just killed that enemy by unleashing the full might of your ridiculous arsenal? Well you better hope no other enemy is around at that time, because your co-pilots consider flaming wreckage as the most dangerous threat in existence. They won't hesitate to fire everything at this wreckage until it disintegrates entirely, ignoring any nearby enemies or objects in the process. Occasionally though, your co-pilot will take pity on you and allow you to fire a different weapon at each target. Gee, how generous. Portal gun: Not really a weapon in this game, but at seemingly random times an enemy will simply vanish instead of exploding in a huge fireball. I can only guess that this happens because multiple shots connected on the same frame, but I'll leave that to a TASer to figure out. Regardless, it doesn't seem to be something you can pull off consistently (with maybe one exception), so I didn't look into why this happens. While it's usually helpful to fire the portal gun, it can sometimes backfire horribly. The combination of a highly armored enemy and a mission critical NPC or item is bad news for firing this thing. As an example, I've had an attempt end in campaign 9 because I fired it at one of the armored cars that contains one of the generals you need to pick up. The guy appeared instantly and quickly ate an absurd amount of firepower. Needless to say, he died a horrible death fitting of the text box that appeared: "Agent destroyed." Motorcycle: The only real thing to note about this heap of junk is that you have to move at a very specific angle to maximize your speed. This isn't always easy to find, because the handling is terrible. It's also poorly equipped, so it's a good thing it's only necessary for two missions. Hovercraft: I've heard a rumor that says this game has a hovercraft. I don't buy it. 1. It never stops moving. 2. Crashing into any object/building is instant death. 3. There are a bazillion things to run into in campaign 7. 4. You're required to use it at least once. 5. Landing the thing is frustrating. That last point is particularly important to note. Turning the thing is so difficult that there's basically a delay between when you hold left/right and when it actually starts to turn. And because it never stops moving, any missed landings (or targets, if you're dumb enough to use it for other things) require a huge circle to get into position for another run. That's not even the worst part either. No, that honor goes to its jinking controls. You can tell that they never intended for you to do it while flying this thing, because holding A only lets you slide incredibly slowly to the left or right. That's actually a good thing when it comes to landing it, so what's the problem? The jinking controls also apparently mix with a form of auto-pilot, but only in the F-117. So if you just turned slightly to the right and held A, the piece of crap will continue turning that direction until you let go of A. Trying to line up on the runway for a landing using A to shift around to the right spot? Tough luck dude, you get to watch as the thing turns off in a different direction at the last second which forces you to start your approach all over again. Danger zones: Basically any area under active radar will count as a "danger zone." This is usually the game's way of telling you to get the heck out or die horribly. For the purposes of running this game though, it's sometimes best to go in anyway and just be extra careful. I'll point these spots out in the campaign comments, but you should note that danger zone enemies have something like 5x armor, 2x attack power, and increased fire rate. There are a few exceptions, which I'll also point out later. Campaign 1: The route for this is a real pain. The car bombs don't appear until after finishing mission 2 and one of them is all the way at the top of the map. Part of mission 1 is nearby, but other than that, it's not convenient to anything. Add in the fact that the motorcade is at the bottom end of the map, and you really don't have many options for route planning. I'm fairly sure the route I used is the fastest one available, but it's still not pretty to look at because of how spread out everything is. I should also note that the Washington monument enemies gave me far more grief than you could possibly imagine. Hellfires and hydras missing (or not firing at all), little RPG dudes eating two hydras without a scratch, the left HARV not spawning on-time, etc. If you can think of a way to screw up that section, I assure you that it happened. Repeatedly. Heck, I had a lot of attempts end because I ran into the freaking gas station even before getting there. That building is strong. The plan for the Library area was a fairly recent development and I think it worked out much better than my original plan. The first two HARVs I go for here were always first, but in the original plan, I went clockwise after that. Part of the problem with that idea is that two of them begin with their turrets aimed at me. So as soon as I get in range, I have to fire some shots and quickly attempt to dodge the missile. This is much harder than it sounds (particularly for the last HARV) and ended in death fairly often. The newer plan that you see here is more consistent because only one of the HARVs has the turret aimed at me by default (top-left). As a result, I didn't have to be as paranoid about taking damage earlier in the attempt. Avoiding damage before this part is extremely difficult, due to the targeting issues I mentioned earlier. Sometimes I'd get to the end with 200+ armor and other times I'd get there with barely over 100 and be forced to play it safe. It was always fun to get all the way to the last car bomb and get screwed over because you had only 60 armor or so and your co-pilot's moving target issues kick in full force. Campaign 2: This one also has some route planning issues, but nowhere nearly as bad as campaign 1. The problem here is that you must complete missions 3, 4, and 5 in order. This means you don't have a lot of flexibility, but at least there aren't huge detours this time. Some of the submarines are far away from each other, but that's fine. Getting through the bridge the first time is 100% consistent, by the way. At the starting angle you just nudge into the bridge at that corner and let go of the D-pad. The game takes care of the rest. There's absolutely no risk of dying in this campaign because I pick up the armor repair after one of the plutonium crates. If I didn't grab that, it's very likely (probably guaranteed) that I'd get shot down by one of the submarines. I could've picked off a few of the pesky AAAs that fired at me while picking up the crates, but the armor repair is right there and takes almost no time to pick up. In case you're wondering, the ammo crates before every submarine are important. After sinking one of them, I'd have something like 0 hellfires, 38 or so hydras, and who cares for the chaingun. This is enough to sink another one, but it takes the rest of the hydras and the remaining damage (quite a bit too) has to be done using the chaingun. This takes far too long, so it's better to pick up the conveniently placed ammo crates. As for the return trip through the bridge, I'll admit it's not pretty. The game is surprisingly picky about where it will let you clip through the bridge. The method I found is semi-reliable, but it requires lining up with the middle of a bridge section. Going in there from an angle would just bounce me back out, so that's why it takes a while to set up. I inch into the bridge until the tip of the chopper overlaps a bit and then turn to the side and hold down. This triggers the collision animation and sends me to the other side of the bridge after either one or two bumps. One was obviously ideal, but two was nothing to reset over. The four RPG guys guarding that mysterious red object (which is definitely not a hovercraft) are a real pain to take out. They are spread out badly and actually hitting them is more difficult than it should be. Campaign 3: There are more route options in this campaign, but there's still one major problem: Mission 4. The prison/barracks/whatever the heck he's in is invincible until you drop the Green Beret off at the landing zone. No idea why, but it throws a wrench into a possibly more efficient clockwise route. On the bright side, this meant that I had a free pass to play this the same way I always have. As for the objectives, mission 1 is a little irritating. Sometimes you get the watch tower problem I mentioned earlier, but more importantly, it's hard to move smoothly between each tower. Jinking may not be the best choice in this situation because of how awkward it looks, but it does at least let me attempt an attack run on that last tower. If anything, I'm just so used to jinking everywhere that I probably would've screwed up horribly if I tried to fly normally for this part. For mission 3, it's not enough to destroy just the radar dishes. The trucks themselves don't count toward mission completion, but they DO provide radar just like the dishes. So while I technically could've left them alone, it would've made the tank depot a danger zone. A Sheridan or even one of those silly car things in a danger zone is extremely deadly and things wouldn't have ended well. Back to the radar trucks though, it's worth noting that destroying the truck usually causes the dish to explode automatically. The only exception to this that I remember is the second truck I take out in mission 3. And yes, I know ramming into that watch tower is a really dumb mistake. I honestly saw it coming, but I must have been like a deer in headlights. It just figures that my best attempt had to have something stupid like that in it. I sometimes wonder if the anger from mistakes like this makes me play better afterwards. It certainly seemed to help in campaign 1, so maybe I should've just played with a permanent grumpy expression on my face for maximum effect? Campaign 4: You can either handle this campaign clockwise or in the intended order. Unlike what I thought early on, intended order is just fine. The watch towers at the start are annoyingly placed and I had to keep an eye out for the guards' death animations. It's too easy to just fire a couple hydras at a tower and just assume the guy died, only to find out at the last tower than mission 1 is not complete and your run is toast. This is most likely to happen with the third tower for some reason. For mission 2, it's important to line up properly and inch to the left after picking up the Green Beret. This triggers the Apache and it's fairly easy to dodge the missile at that point. Once you move past him, I think the game kind of forgets the enemy exists because he doesn't attempt to come after you anymore. This seems to be a quirk with Apache AI, because a similar thing is exploitable in campaign 6 if you're good enough. I guess they just have a short target acquisition range, which is something I'm grateful for. 300 armor and 150 damage missiles is no joke. Speaking of Apaches though, mission 3 is kind of neat. There are roaming and stationary chopper types here and you're supposed to destroy the choppers and the pads. Turns out that roaming choppers don't count toward your total at all, but stationary ones do. So if at all possible, you want to dodge the first attack from a roaming chopper and quickly shoot the pad before it does too much damage to you. It's too slow to bother shooting them down anyway even if there was a convenient ammo crate. Because of that, this mission is very tense and can easily screw you over if you take too many hits. Heck, I've even had an attempt end because I got too trigger-happy and was left with little more than the chaingun on the last Apache. That was such a horrible way to lose an attempt. The rest of the campaign is mostly self-explanatory. Yes, the fuel death was intentional. I think there's a fuel drum in one of the huts near some of the prison cages, but the detour probably means it wouldn't have mattered much. To be perfectly honest, I didn't even remember it until just now. Huts have a quick explosion animation, so it would all come down to how far off the path it is. The fact that I'm aware the hut exists but didn't add it to the route might be worth noting though. By the way, the quick ladder didn't seem to be worth the detour. I'd either need to take a huge detour to get it during mission 3 or pick it up after dropping off the load of passengers, which would make it mostly pointless. Campaign 5: This is the campaign that will never go perfectly no matter how many times you try. I'm convinced that mission 1 was specifically designed to frustrate the player. They definitely succeeded at that. You need to pick up 18 of the 21 civilians and you need to pick up 2 scientists later, so you need to drop off passengers three times. That's only slightly annoying, so what's the problem? The civilians have HORRIBLE AI. They find it amusing to stand as close to the building as possible, expecting you to pick them up from that spot. In some cases, this is literally impossible to do even if you take the collision from getting too close. And before you say anything, ramming into one of the buildings at least once in this campaign is practically inevitable when you're in a hurry. Amusingly enough, the best strategy for dealing with these pesky little ants is to shoot them. I'm completely serious. You can afford to take down three of them without a SNAFU, so if one of the buggers derps his way into the archway, just shoot him. This came up often at the third building, where one of the ladies just loved standing in the archway. It didn't happen this time though, which really struck me as odd. The fuel pickup after mission 2 is technically unnecessary, but that's cutting it way too close for comfort. It worked once or twice in practice, but of course when I tried it in a real attempt, I wasn't anywhere near quick enough. Learned my lesson right there, just like when I tried an experimental plan for mission 8 that backfired and ruined an otherwise fantastic attempt. More on this in a bit. Mission 7 is no concern in a danger zone, as you can see. Mission 8 is a different story though. I'd put those little cars up there as the second-most dangerous enemy type in the game, right behind the M1 battle tanks. They normally have 100 armor, 30 attack power, and fire at a decent rate. In a danger zone, they will destroy you in no time. This is why I take the time to loop around the two outside the landing area. The experimental plan I mentioned involved cutting through the middle of those two cars at just the right spot to not get the top car's attention. I'd be able to ignore the top car completely if I was careful enough, but holy crap that plan was so dumb. It works fine with savestates during practice, but it's a horrible idea in real-time. The area around missions 3 and 5 is the spot that I'm likely get shot down because it's hard to get away from mission 8 without taking a beating. The danger zone is actually not that scary because MLRS are pathetic enemies. The bigger threat comes from the RPG guys inside one of the mission 3 buildings. Shooting the 5 stacks of money while dodging constant missile fire is no easy task when you're probably low on armor to begin with. After jumping on the motorcycle, you can actually clip through the corner of the wall to save a couple seconds. It's not very difficult to do on the way out, but it's the kind of trick that seems hard to be 100% consistent at. If you fail, you lose far more time than you'd ever save. Because of that, I felt it was wise not to push my luck. As for the route, I go clockwise for the most part. Mission 1 is always a shining example of targeting mishaps, so that doesn't even surprise me anymore. Seeing Roz miss a Gatling Gun that you were flying directly toward is a special moment I'll cherish forever. It takes real effort to miss that badly. Mission 4 is a danger zone when you do things out of order like this, but the gunner in that silly M1 makes a mistake which he soon regrets. Mission 6 is self-explanatory once you note that the radar truck isn't marked on the map and covers the power grid. In a rare instance of proper targeting priorities, it's often difficult to fire at the power lines instead of the patrolling tanks. Unfortunately, this is the one time I wish Wild Bill would go back to being an idiot. The fuel drum is required to keep this campaign at 1 death. In an older version of the route, I expected a second death from either the Apaches or from lack of fuel. In that version, I destroyed the second Apache that you see in this run. It turns out that causes another one to spawn at the next bunker, so I was shooting myself in the foot. I spare it in the newer version, but it's really hard to do it correctly. The idea is to approach the bunker from the top and just barely get into range. Too close spawns the chopper and it comes after you. You can see that I didn't get it right this time, so I had to play matador instead. Campaign 7: Remember when I said the F-117 was a piece of junk? Here's your proof. I lined up on the runway the first time only for the game to go "ha ha, no" and kick in the jinking turn at the worst possible time. I did my best to recover from that, but I'll admit it's not pretty. If you're wondering, I could've attempted the landing much sooner than I did but there's less room for error. Looping around the skull pillar makes it easy to know when you're far enough away to try landing and gives decent time for lining up. Not much else to really say about the rest of this campaign, other than the fact that it's usually quicker to just shoot the items in the pyramid things. You could pick them up with the winch, but if your co-pilot lowers the ladder for a scientist instead, you just lost time. Some of those items take far too many shots to destroy and I really don't know why either. It's almost as if the hitbox is tiny and most of the bullets are missing even though it looks like they aren't. Campaign 8: Danger zone mission 4 is scary stuff, but it's possible to make it out alive...barely. Keyword there, because one mistake will end you. As you can see, I made one of those mistakes this time. It actually doesn't really cost me much (if anything), because if I didn't get shot down I would've had to detour for an armor repair anyway. What did cost me time was that dumb mountain incident before mission 1. So frustrating when they jump out in front of you like that. Freaking moving mountains. Mission 1 is only a danger zone if you approach from the top, which is unfortunately the best balance between difficulty/speed. It's possible to complete the campaign by going clockwise to avoid this danger zone, but that causes every other mission to be one instead. It's obviously not a very good tradeoff. As for the towers, I'd normally skip destroying the M1 at the second set. I changed my mind because I didn't want to risk a second death and it doesn't take long. Mission 2 wasn't particularly good, but I'll take it. The idea is to use the first mountain as a shield so that the Battle Cannon destroys it for you (200 armor -> 200 damage missile). My positioning must have been off a little, because he aimed off to the side instead. No big deal though, I had just picked up ammo for this sort of thing. The rest is just a mess of trying to clear out the enemies and hope auto-targeting doesn't wreck you when it comes to destroying the tomahawks. Only missiles can hit them and they have 100 armor, so it's sometimes a pain to actually get enough hits to register. It's possible that I could've skipped the armor repair before mission 3, but it would be unlikely to avoid another death if I did. Unlike the mission 4, this armor repair is directly on the way to mission 3 so it's quicker to pick it up. The low fuel warning went off sooner than I'd like, which was a clear sign that my campaign 8 wasn't particularly good. Still made it through on a single tank though, which is what really matters. Campaign 9: This is supposed to be a breather campaign after crazy stuff like 6 and 8, but it's actually kind of tough in a run. While I still start with a normal amount of ammo, I have to be careful with my shots until the first ammo crate. There's a lot of stuff to destroy before then and running out of hydras at the first armored car wastes time and almost guarantees a death. So you'll notice that I take out the RPG guys with the chaingun instead and just focus more on dodging. The first two ACARs are somewhat annoying because of the moving target problem and they do decent damage too. Armor is also a concern throughout the entire campaign, because I don't have time to detour for an armor repair. I needed to destroy 13 ACARs to complete mission 2, so I did my best to spread them out while I was completing other objectives. Targeting issues kick in multiple times in this campaign if you're not careful. The first time is the fifth ACAR, because a freaking Attack Van spawns right next to it. Sure enough, your co-pilot assumes the van is a more threatening enemy (it really isn't) and fires everything at it instead of the ACAR firing at you. My goal was to approach from the side and just barely get into range, but that rarely works out. After 10 ACARs, the mission 4 armored cars appear. I make sure to approach the first one from the side/rear to limit how much damage I take. My decision to finish the tenth ACAR with the chaingun seems to have been a good one, because you can hear the hydras click just as the first armored car goes down. From here the rest of the campaign basically boils down to firing everything, picking up an ammo crate, and repeating. The first nuke truck area is irritating because again Wild Bill decides to demonstrate his poor sense of priorities. I came in a bit too low, so he assumed that ammo truck was a vicious enemy and ignored the ACAR. It's helpful to destroy the ammo truck quickly, but I'd certainly prefer killing the enemy first. The last nuke truck was a little scary because of the low armor warning before I got there. This triggers when you have something close to 100 armor remaining and the RPG guys deal 75 per shot. And since there are two of them in that spot, you can see why I made it a priority to take them out first. Luckily for me the truck is heading the direction I need to go afterwards anyway, so ignoring it for a while doesn't hurt as much. My approach to the landing zone was honestly rough, but at least I didn't run into that stupid gate in the process. That would've been horrible. Anyway, it's time to wrap these comments up. I'd say this run is fairly good overall, though I did make more minor mistakes than I care for. I'm extremely tired of running this game though, so I'll just leave this one alone. Feel free to take a shot at an improvement if you want, but I can't recommend it. It's definitely a case of a game that's not very difficult to play casually but becomes a total nightmare when going for speed. I think there's at least 15 seconds left to shave off this time even without a much higher level of play, but getting a run without noticeable mistakes of some kind seems close to impossible. Good luck to you if you want to try though.